(b) parents; or community members selected by parents. equal numbers of parents or community members selected by parents and students. At the discretion of the local governing board, the middle school may, but is not required to, include student representation on the SSC. If a middle school SSC includes students, the SSC must meet the composition requirements of secondary schools. The means of selecting SSC members is not specified in law, except that members must be chosen by their peers (ECSection 52852). No additional membership qualifications may be required. Beyond the composition requirements stated above, no member position on the SSC may be reserved for any group or individual. SSC membership may be determined by ballot or may be decided in an open meeting by voice vote. Many schools elect members for a two-year term, with elections for half the members held in even years and half in odd years. This practice ensures that the SSC will not be composed entirely of new members each year. Some schools assure additional continuity by electing non-voting alternate members, who are seated as voting members by the SSC in the event of a midterm vacancy on the school site council. At the first meeting of the School Site Council, members receive training and guidance in their roles and responsibilities. Throughout the year they review pertinent school data and discuss programs in place to support the school mission and vision. The following documents can be used in these efforts. In addition, each school site has been provided with a copy of School Site Council, Forging Partnership in the Era of Local Control. 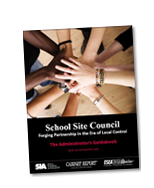 This book is a comprehensive guide for school and district administrators for establishing and managing an effective SSC.